The phrase "Big Bang" summarises the most widely-accepted scientific theory of how the known universe developed into its present state. The evidence suggests that a period of expansion began about 13.8 billion (±200 million) years ago and has continued ever since. The actual cause of inflation has not been fully determined, although the basic model makes some predictions which have been confirmed. Many views exist on what new physics will show about the beginning of the universe - because that is still an open question. In one proposal, space and time (spacetime) began to exist 13.8 billion years ago. In other proposals, the universe has inflationary periods. In yet another proposal a "multiverse" existed before our universe began. The details of what happened prior to 13.8 billion years ago (or if that even makes sense) remain to be worked out. Note that the Big-Bang theory does not attempt to describe the initial conditions or first cause of the universe. The theory merely addresses the development of the universe from its extremely dense and hot early stages into its present form. (Compare and contrast how the theory of evolution likewise does not concern itself with the origin of life on Earth; but merely with its development after its origin.) It is instructive to think of the Big Bang not as a localized explosion from which all matter moves away, but rather as a uniform expansion of space itself. [notes 1] An observer at any point in the universe sees the same thing: a homogeneous distribution of matter everywhere, with the more-and-more distant parts receding faster and faster. 10 So what happens next? People have speculated for hundreds of years that the universe had a beginning - such speculation presaged the Big Bang premise. Astronomers such as Johannes Kepler (1571-1630) argued that the universe was finite in age. Edgar Allan Poe in 1848 saw the Universe as cyclic in nature, expanding and contracting from a single primordial state. Poe also believed that time and space were one, nearly 100 years before Albert Einstein would prove it so. In 1927, Belgian physicist and Catholic priest Georges Lemaître proposed an expanding model of the universe to explain the observed redshifts of spiral nebulae. Edwin Hubble provided the observational evidence of redshifting galaxies in 1929. Einstein, having deliberately implied that there was a Big Bang in his 1915 theory of general relativity, proved that the mathematical evidence pointed towards a starting point of time and space. Georges Lemaître noticed Einstein's implication, and so Lemaître officially announced the Big Bang model. At the time, however, it was not called "the Big Bang". Lemaître called it his "fireworks" theory because he envisioned an explosive beginning. The term "Big Bang" did not come about until 1949, when Fred Hoyle (himself a proponent of the steady state model) coined the term "Big Bang", as a derogatory label. There are two assumptions required to construct the Big Bang. There is empirical evidence for both of these assumptions, and they are considered to be reasonable, defensible statements rather than postulates. The laws of physics are the same everywhere in the Universe, and were the same throughout the history of the universe. On a sufficiently large scale, the universe is homogeneous and isotropic. The first assumption is straightforward, because a) There is no evidence to the contrary and b) Without it you might as well give up on doing any astronomy, astrophysics, or cosmology at all, since if physical laws in the Andromeda galaxy are somehow different from where we live, but the differences are so subtle that we can't detect any from where we are — well, it's pretty hard to go there and measure them. This assumption is necessary because when talking about how things interact on galactic, much less universal, scales, we need to use general relativity. It's much better if general relativity applies to other galaxies in the same way that it applies to ours. The second assumption is known as the cosmological principle which has strong empirical support. It's essentially a stronger version of the Copernican principle, which says that the Earth has no special place in the cosmos. In spite of its name, the Big Bang theory says nothing about how the Universe first came into being. In other words, it says nothing about the Big Bang itself. All it says is "OK, we know the laws of physics at these energy scales, so we can extrapolate back to around 10-43 seconds, but beyond that we have no idea what happened; we'd need a quantum theory of gravity for that." This section will give a timeline of the big bang theory. After 10-43 seconds, the universe had cooled down to a chilly 1027 K, causing gravity to split off the other three forces. While the Standard Model of particle physics cannot accommodate such a Grand Unified Theory (GUT), many theories beyond the Standard Model, e.g. Supersymmetry, can. In quantum field theory (the description of particle interactions on the fundamental level), particles do not have bare masses — mass is a consequence of a process called spontaneous symmetry breaking. In the highly symmetric GUTs, particles are massless. The horizon problem: Matter in the present Universe is extremely homogeneous; the density of galaxies and gas clouds is the same no matter which direction we look. Furthermore, the temperature of the photons of the cosmic microwave background from one direction are the same as from the opposite direction. These photons come from two points in the universe that were never in contact. Yet somehow, they are the same temperature! The only way to resolve this was if the Universe expanded very rapidly in its early stages. The monopole problem: Many grand unification theories (GUTs) predict the existence of magnetic monopoles, and moreover predict that they would've been produced in large numbers in the initial very hot state of the Universe. However, we see very few of these in nature. Inflation solves the puzzle of magnetic monopoles by spreading them out over vast spaces in a relatively short (tiny fractions of a second, but longer than the lifetime of the universe prior to the onset of said inflation) period of time. The initial fluctuations problem: As mentioned above, small over- and under-densities in the early Universe were the seeds for the formation of galaxies and large scale structure. The question remains, though: why are the fluctuations there, and what dictates their form? Inflation says that they are there from quantum (not classical; remember, those are wiped out by inflation!) fluctuations when the Universe was Planck-sized. They were then amplified to galactic scales. Inflation also predicts the form of the fluctuations. This inflation occurred at a speed much faster than the speed of light. By the time the Universe was a fifth of a microsecond old, it was the size of the solar system. Of course, the natural question to ask about inflation is "What bizarre form of matter could cause that?" It turns out that if you have a scalar field with the right potential, then an inflationary epoch will take place, and it will satisfy the conditions to solve the problems listed above. Using the right potential, one can also arrange for a graceful exit. This means that there will be a smooth transition from the inflationary epoch to a Friedman expansion. There are many concrete inflationary scenarios (which of course result from choosing a potential) that have been proposed. So, what is the 'inflaton', the particle that caused it? Physicists originally thought that the Higgs field was the field causing inflation (or, the Higgs boson is the inflaton). However, the potential (the Higgs, or Mexican hat potential) does not have the right properties, so some other scalar particle must be the inflaton. It is currently thought that the inflaton is a "beyond the Standard Model" particle. Another important piece in this story is the phase transition known as reheating. Reheating is the process by which the inflation field decays to the other particles, like quarks, electrons and photons. Chaotic inflation theory, or bubble universe theory or eternal inflation theory, is an alternative model of inflation. Developed by physicist Andrei Linde and others in 1986, it solves a problem of the inflation theory, namely how to end the inflationary period. 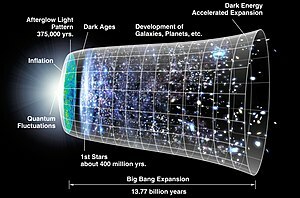 It says that the Big Bang was the start of the multiverse, the faster-than-light inflation never ended and never will, and that universes arise from quantum fluctuations in the void outside universes, though the FTL expansion ends almost instanly, unlike the multiverse which has done this ever since the Big Bang and always will. Data from space missions devoted to study the cosmic microwave background as NASA's WMAP or ESA 's Planck give strong support to the inflationary theory, and results from the latter validate the simplest models. However there are still many inflationary models to choose from and some cosmologists are still skeptic of said theory. Cosmic inflation bears no relation to the macroeconomic phenomenon of inflation, except insofar as books about it cost slightly more every year. Since the strong interaction split off the electroweak interaction already after the end of the GUT era, the inflationary epoch is sometimes considered to be part of the electroweak epoch. The strong interaction had become a separate force, but electromagnetism and the weak interaction were still united. Photons (and Z bosons) did not exist as separate particles — they are really a combination of the W0 and B0 boson, and those two existed as separate particles back then. Also, the W+, W-, W0 and B bosons were massless, although W+ and W- are third most massive particles in the Standard Model — they acquire mass through the Higgs mechanism which breaks the electroweak symmetry and gives rise to a separate electromagnetic and a weak interaction in the present-day universe. After reheating, there was a soup of Standard Model particles. At first, there was a quark-gluon plasma. The quarks and gluons are not bound to each other at these high energies. At first, this may seem puzzling; isn't the color supposed to be confined? Yes, but only at low energies. Quantum chromodynamics has a peculiar property called asymptotic freedom. That is, at high energies, the force actually becomes weaker. Anyway, when the plasma has cooled sufficiently, the quarks and gluons are bound together into baryons. Antibaryons (the antiparticles of baryons) are also present, and they annihilate with the baryons. It would seem that antibaryons and baryons would be produced in equal amounts. If this were the case, all antibaryons would annihilate with the baryons and there would be no baryons left. This is obviously not the case, so some process must have favored baryons over antibaryons. In other words, there were slightly more baryons than antibaryons. Some of these baryons eventually became nuclei of helium or heavier elements through nucleosynthesis. We will have more to say about this later, but first, we will discuss the thermal history of the leptons. We first need to talk about thermal decoupling. Consider two species of particles, A and B. They have some reaction that keeps them in thermal equilibrium. If the rate of the reaction γ is smaller than the rate of expansion (that is, the Hubble constant), then the particles are in thermal equilibrium and have the same temperature. When this condition fails to be met, the particles are no longer in thermal equilibrium and are said to have decoupled. In the early Universe, the neutrinos were in thermal equilibrium with everything else. However, after a certain time, the reaction rate sustaining that equilibrium became greater than the Hubble constant and the neutrinos decoupled. They should still be visible today, but because they would be swamped by high energy neutrinos from various astrophysical sources, they would be difficult to detect. Anyway, shortly after neutrino decoupling, electron-positron annihilation took place. As with baryon-antibaryon annihilation, there must have been a slight excess of electrons over positrons in the early universe. We will now, as promised, discuss nucleosynthesis. Neutrons and protons are kept in chemical equilibrium by certain reactions. Once the rate of these reactions is greater than the rate of expansion, they are no longer in equilibrium and the ratio of protons to neutrons "freezes-out." This means that the neutron-to-proton ration is constant. Now, one neutron and one proton will sometimes be fused together into a deuterium nucleus. These could be fused together into a helium-4 nucleus, but the reactions are not efficient enough for this to happen. Once the temperature cools enough, nucleosynthesis begins. Helium is fused extremely rapidly, far from equilibrium. However, in practice, we can use a quasi-equilibrium approximation for nucleosynthesis calculations. Once the reaction rate is again bigger than the rate of expansion, the helium abundance freezes out. Similar things happen for lithium and a few other metals. (Astronomers use metals to mean anything other than hydrogen or helium.) One can calculate the abundance after big bang nucleosynthesis and it is roughly 75% hydrogen, 25% helium, and trace amounts of metals. This is exactly what is seen in the interstellar medium. So now one has an (opaque) plasma of ionized hydrogen and helium nuclei. Eventually, the temperature will cool enough for electrons to be bound to nuclei. This is known as the epoch of recombination. : the Universe would have become transparent to radiation with the photons that form the cosmic microwave background having been emitted by then, (see further). While radiation could travel very freely across the Universe, it was a dark place filled with just very little more than hydrogen and helium atoms. These so-called "Dark Ages" lasted seven hundred million years until the first stars formed, finally lifting that dark veil. As mentioned, the quantum fluctuations from inflation became the seeds for galaxy formation — they grew by gravitational instability and became the galaxies and large scale structure, turtles all the way down a web of galaxies and clusters of galaxies surrounding large, almost empty, voids, we see today. From there onwards, the evolution of the Universe seems to be better described by the standard cosmological model, known as Lambda-CDM . Do Americans understand the Big Bang theory? In a recent survey "just 39 percent answered correctly (true) that "The universe began with a huge explosion". On the face of it Americans do not understand relevant cosmology very well but the survey is at least partly wrong. Scientists disagree whether the Big Bang can be called an explosion. So respondents who deny that the Universe began with an explosion include two groups. There are those who do not understand the science well enough to know that the start of the Universe can be conceptualized as an explosion. There are also those who understand the science well enough to know the Big Bang was not like explosions as we usually understand the term. This illustrates how even surveys intended to be accurate can be wrong. Intentionally inaccurate surveys are a branch of pseudoscience at best, but worse a deliberate intent to delude those taking the surveys, or those reading the results. There are four primary pieces of evidence for the Big Bang that are so well-established that they are referred to as the "four pillars" of the Big Bang. While other pieces of evidence exist, these four are the most compelling. Up until the early 20th century, the Universe was thought by most scientists to be static and unchanging. However, Edwin Hubble's observations and analysis in the late 1920s showed that assumption to be mistaken. He found that the recessional velocity of a galaxy is directly proportional to the its distance to the observer. This result is known as Hubble's law; the constant of proportionality is called Hubble's constant. There are two possible explanations for these observations. The Earth is at the center of a massive explosion of galaxies. The Universe is uniformly expanding. Explanation 1 is untenable because it is in conflict with the cosmological principle (see above starting assumptions). That leaves explanation 2. If the consequences of Explanation 2 are extrapolated into the past, all the matter in the observable universe would have been at a single point approximately 13.8 billion years ago. If the matter in the early universe was highly compressed, it would have been extremely hot and dense — so much so that baryons couldn't form, much less atoms, and there was simply a sea of electrons, quarks, and photons. The photons would constantly interact with the electron-quark plasma, constantly forming and annihilating without going very far. Over time, the Universe cooled enough that the quarks could combine into baryons (mostly protons and neutrons). After further cooling, about 3-20 minutes in, the protons and neutrons could combine into small atomic nuclei (although most protons did not). After even more cooling, about 370,000 years in, the nuclei could combine with electrons to form neutral atoms. Once the Universe cooled enough to allow electrons and nuclei to combine into neutral atoms, the remaining photons were "released", meaning they could travel large distances as radiation without interacting with a charged particle. Thus, if the Big Bang occurred, we should see vestiges of this radiation permeating all space, and it should look the same in all directions. Since it was emitted by a Universe entirely at thermal equilibrium, this radiation should also display a black body spectral pattern. Not only is it a black body spectrum, but it is the most precisely measured black body. On plots showing data and the fitted spectrum, error bars are normally far too small to be seen and are commonly scaled up 400 times to be visible. 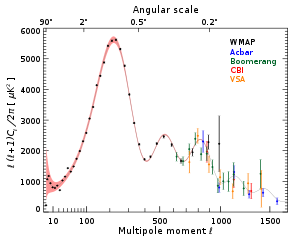 The angular power spectrum measured by various experiments, with best-fit ΛCDM model also shown. Furthermore, the radiation would have been very highly energetic, with a very short wavelength, at the time of the Universe becoming transparent to light. However, the Universe's expansion since that time would have lengthened the wavelength of that radiation, or, equivalently, cooled it considerably. Over time, the radiation would transition from X-ray levels, to ultraviolet, to visible (yikes, good thing our eyes didn't exist then), to infrared, to microwave. Today, anyone can point a radio telescope at the sky and find an isotropic, black body spectrum of radiation peaked in the microwave region of the spectrum, with a temperature corresponding to 2.726 Kelvin on average. If you don't own a telescope, just try tuning your TV reception into a nonexistent channel; some of the static you see is the left over radiation from the Big Bang. Note the many colored spots that can be seen on the map of the cosmic microwave background taken by the WMAP satellite, showing very small (millionths of K) temperature differences on it. Most of them are irregularities born in the cosmic inflation, that erased almost all the pre-inflationary ones, and are the seeds around which grew the structure of the Universe. The angular power spectrum describes on what scale these variations tend to occur. The exact shape of this spectrum can be predicted from theory and shows good agreement with experiment. Starting at about three minutes after the Big Bang, and ending at about twenty minutes after, the temperature of the Universe was low enough that protons and neutrons could form, but still hot enough that nuclear fusion reactions could occur. During this period, the bulk of the Universe's helium was formed (the amount of helium added by stellar fusion since is small compared to the primordial amount). Additionally certain light elements, such as deuterium and certain isotopes of lithium and beryllium, can not be formed in significant amounts in stellar fusion reactions since any stellar core hot enough to create them is also hot enough to continue to fuse them into heavier elements given enough time. These elements can only be created in a fusion epoch much shorter than the lifespan of a star. As observed, the composition of the matter in the universe is basically 75% hydrogen and 25% helium with trace amounts of the light elements created in the nucleosynthesis epoch. Even more cool, it's possible to predict relative abundances of this matter using a single parameter, the photon-to-baryon ratio. The correct photon-to-baryon ratio can be determined by measuring tiny fluctuations in the cosmic microwave background radiation. Using the value of the photon-to-baryon ratio derived from the cosmic microwave background to calculate the predicted elemental ratios yields numbers extremely close to those observed spectroscopically. The distant galaxies from us are many light years away, so when we observe them, we are seeing them as they were long ago due to the light travel time. Consequently, we can get pretty good ideas about star formation, galaxy formation, galaxy cluster formation, and supercluster formation because we can see snapshots of these things happening at different eras. It turns out that galaxies that formed long ago are quite different from the nearby ones that we see today, as measured by star and quasar formation. These observations suggest that the Universe was different in the past than it is now, which is evidence against the "steady state model" of the Universe that was an alternative to the Big Bang before the cosmic microwave background radiation was discovered. These days pretty much all scientists acknowledge that the Big Bang is the way to think about the early formation and growth of the universe. Of course, whenever any, any two given scientists happen to disagree about even the most minor aspect of the theory, the conversation is mined for any quotes which could be misrepresented to support creationism. However, any discussion about the development of the Universe is bound to be severely limited — the whole of our observations are made from just one tiny corner of space, in the blink of an eye. We are not done learning yet. Many creationists often misrepresent the Big Bang theory, as only some of them understand the theory and its implications. I in fact have worked with several other people for some period of time on the question of whether or not it's in principle possible to create a new universe in the laboratory. Whether or not it really works we don't know for sure. It looks like it probably would work. It's actually safe to create a universe in your basement. It would not displace the universe around it even though it would grow tremendously. It would actually create its own space as it grows and in fact, in a very short fraction of a second it would splice itself off completely from our Universe and evolve as an isolated closed universe growing to cosmic proportions without displacing any of the territory that we currently lay claim to. "What was there before the Big Bang?" "The question is nonsensical, because there was no time (or space) for anything to exist in, so the word before is meaningless." This meaninglessness was pointed out in an excellent analogy by Stephen Hawking, who described the question as "like asking what is north of the North Pole." (Or just ask these people, who are so far north that a compass actually points west. "Just nothingness, from which a quantum fluctuation appeared that would be the Big Bang"
"The Universe itself existed forever before the Big Bang, likely in cosmic egg-esque faction (for example as a "quantum hell" (infinitely hot and devoid of space time), before going boom. "Something can't come from nothing, so therefore, GOD!!! The limit for knowledge about the Big Bang is Planck Time. The Planck Time is the shortest meaningful length of time. It is somewhere around 10−43 seconds, which is extremely short, but not zero. It is not possible to know what happened less than one Planck Time after the Big Bang. Indeed, it is not just not possible to know what happened, it is actually meaningless to even ask the question. That being the case the question of what happened before the Big Bang is also meaningless. We just have to lump it and get on with asking questions which are meaningful. As Brian Greene put it, "A common misconception is that the Big Bang provides a theory of cosmic origins. It doesn't. The Big Bang is a theory … that delineates cosmic evolution from a split second after whatever happened to bring the universe into existence, but it says nothing at all about time zero itself. And since, according to the Big Bang theory, the bang is what is supposed to have happened at the beginning, the Big Bang leaves out the bang. It tells us nothing about what banged, why it banged, how it banged, or, frankly, whether it really banged at all." You could say that the Big Bang theory is to the origin of the universe what the theory of evolution is to abiogenesis. Hawking's book A Brief History of Time gives a reasoned explanation of the Big Bang and subsequent events, but is popularly reckoned to be intensely dense to the point of unreadability. Another book A Briefer History of Time has since been published. Julian Barbour suggests that reality simply terminates on nothing at the alpha point, as a brute fact, in the same way that England abuts the sea at Land's End without requiring an explanation. It is notable the pillars of modern physics, quantum mechanics and general relativity, work together consistently enough to give rise to the discipline of cosmology, the study of the Universe as a whole. Many questions have been answered yet many remain. "How was the Big Bang initiated, if not by a supernatural being?" they ask. "How was the supernatural being created if not by a supernatural being?" Which invariably leads to special pleading: "God is God, and therefore he is exempt from what is possible and what is impossible, since he exists independently of time and space. "If he exists independently from time and space, then why did he need to create (which means to make something that didn't already exist prior) the universe in order for it to exist?" ...and so on ad infinitum. (Another way of using the Big Bang as proof of God plays on the common misconception that it was a bang. Saying "The big bang happened when God said: "Let there be light"". This ignores the fact that for millions of years light couldn't propagate due to the density of the universe.) This paradox is unsolvable, so in the end, it comes down to a question of faith or lack thereof. In A Brief History of Time, Stephen Hawking outlines the mathematical use of imaginary time which results in the description of the universe as being of a hyperspherical nature without start or end — these being merely points on a "surface" undistinguished from others. The upshot is that the requirement for "start" and "cause" are removed, as is the need for faith (a concept which has no place in science). Interestingly enough, the Big Bang theory was first proposed by a Catholic priest and professor of physics Georges Lemaître. He first brought the theory to public attention after the discovery of redshift of nearby nebulae, although it was Fred Hoyle who coined the actual name as a derisory term. (In much the same way that René Descartes coined "imaginary numbers" as a derogatory term for Cardano/Bombelli's complex numbers.) Compared with current Big Bang theory, which incorporates aspects such as inflation, Lemaître hypothesized that all matter for the Universe came forth from a "primeval atom", today more commonly described as a singularity. Keep expanding, until it expands so far it cannot collapse back upon itself. Eventually matter and energy would be so spread out that no particles would interact again. This is called "the heat death of the universe". Keep expanding, but reduce the rate of expansion, asymptotically reaching 0. In this scenario, the Universe would go into heat death too. Keep expanding, but at slower and slower rates, until gravity takes over, compressing all the mass back into a singularity, perhaps kicking off another Big Bang. A fourth option, which was only recently discovered, is that the expansion will keep accelerating until the Universe is torn apart at the atomic level. Recent studies into the cosmic microwave background radiation, gravitational lensing, and, most importantly, improved measurements of supernovas have led to the discovery that expansion really is accelerating. A possible explanation for this acceleration is the fact that, as the Universe expands, the density of dark matter decreases while the density of dark energy remains constant, thus leading to an eventual predomination of dark energy which in turn drives the expansion. ↑ In other words space is expanding in all directions equally, not just one, so comparing the expansion of space-time to something like an explosion is misleading at best. But "Big Bang" makes for a catchy concept. ↑ Although the Big Crunch hasn't been entirely ruled out because we don't know if the universe is finite or not, if it is infinite it won't happen, if the universe is finite a Big Crunch will happen. ↑  "The age of the Universe can also be estimated from a cosmological model based on the Hubble constant and the densities of matter and dark energy. This model-based age is currently 13.8±0.2 Gyr. But this Web page will only deal with actual age measurements, not estimates from cosmological models. The actual age measurements are consistent with the model-based age which increases our confidence in the Big Bang model." ↑ 2.0 2.1 See the Wikipedia article on speculative physics beyond the Big Bang. ↑ See the Wikipedia article on Anisotropy. ↑ Scientific American Special Edition — The Cosmic Life Cycle, 1994-2007: "The Evolution of the Universe", P. James E. Peebles, David N. Schramm, Edwin L. Turner and Richard G. Kron. ↑ Cosmos, Carl Sagan. 1985. ↑ Emily Eakin. THINK TANK; What Did Poe Know About Cosmology? Nothing. But He Was Right. New York Times. 2002 November 12. ↑ See the Wikipedia article on Georges Lemaître. ↑ "Did Einstein predict dark energy?" ↑ Scientists expect that once we've a working theory of quantum gravity we'll be able to probe what happened in this era. Stay tuned. ↑ As in, there have been no confirmed observations at all; this fact can be used to place strict upper limits on how common they are. See this review for a more thorough treatment and estimated values. ↑ Scientific American Special Edition — The Cosmic Life Cycle, 1994-2007: "Inflation in a Low-Density Universe", Martin A. Bucher and David N. Spergel. ↑ Hubble's law. Cornell University. Astro 201. ↑ Nevertheless, creationists would have everyone believe it's true; see quantized redshift for one of their thoroughly debunked claims. ↑ Physicist Aims to Create a Universe, Literally, Malcolm W. Browne, The New York Times, 1987. ↑ Parallel Universes (transcript), BBC, 2002. ↑ Greene, Brian. The Fabric of the Cosmos Vintage paperback ed., 2005, p. 272. Emphasis in original. This page was last modified on 30 March 2019, at 02:18.